A robot seems like a pretty big-ticket item. 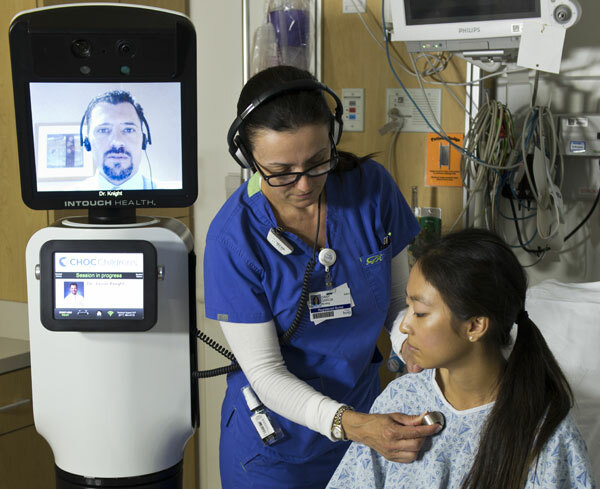 But if a patient can get a health problem taken care of sooner with a specialist because of a remote-presence telemedicine robot, it could prevent many serious and costly health problems down the road. Manufactured by InTouch Health Inc. (Santa Barbara, CA) together with iRobot (Bedford, MA), the RP-VITA robot provides high-acuity telemedicine consults. The device, a finalist in the Medical Design Excellence Awards, also does away with the need for telemedicine-specific staffing because it can actually drive itself around an emergency room or intensive care unit. In the long run, telemedicine systems such as the RP-VITA can be used to boost the efficiency of physician-patient interaction. Its intuitiveness, ease-of-use, and safety features encourage physician adoption and clinical use. InTouch has actually been engaged in remote-presence telemedicine for a decade. "The whole idea of this remote presence is to enable the right clinical expertise to be at the right place at the right time. If you can do the right thing on sick patients on a timely basis, you can improve quality and reduce costs.... The objective is to make it easier and easier for physician experts to perform the tasks they would do as if they were there," says InTouch Health CEO Yulun Wang. Medical Design Excellence Awards winners will be honored at a June 11 awards ceremony to be held at MD&M East, June 9-12 in New York City. It can be a hindrance, however, for physicians to access a telemedicine robot on the go if they need to pack along a joystick to navigate the robot to wherever it needs to be inside a hospital. What iRobot was able to do for InTouch with the RP-VITA was to combine multiple types of sensors and sophisticated software algorithms that enable the robot to drive itself from its docking station to wherever it needs to go and then back again. An infrared grid, invisible to the human eye, is projected through the healthcare facility, which the RP-VITA picks up with its own infrared camera to engage in navigation. Simultaneously, the robot also utilizes light- and sound-based sensors to further understand its positioning, Wang notes. Specifically, the RP-VITA uses a fusion of date from LIDAR, sonar, and PrimeSense sensors to map, avoid obstacles and navigate autonomously. InTouch employs a razor-razorblade strategy with the RP-Vita, charging $5000 to $6000 a month to service and support a single robot. But the robot would pay for itself if, say, a stroke was caught early in just one patient because a specialist was able to remotely access him in an ER. Long-term care costs would then be avoided. "We're trying to figure out how to provide higher quality at a lower cost. That's the objective here," Wang comments.